Ever wonder what purchase power you have when buying a home? Here is a great diagram to show you when interest rates rise, how that effects the amount of home you can buy. As interest rates rise, the amount of home you can afford decreases. A. 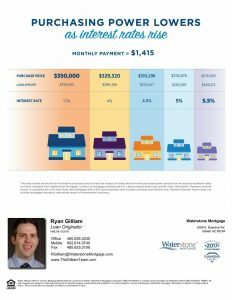 Interest Rates are Rising-Buy your home today before the rate increase. B. Purchase More home now then down the road-The higher the Rates the less home you can afford. C. Buying a home before the End of the Year-Buying a home before the end of the year, you will have a great tax write off. B. Home Inventory is still low, and buyers are having a hard time finding homes- with low inventory many Sellers have multiple buyers.